Great Pecha Kucha session here at SFI on your thermometer project! She (Brenda) is adorable. Brenda did a knockout job! Awesome photos! Awesome delivery! I get she’s a rockstar. By the way, Brenda did an amazing job. I suspect that you have already heard this many times from other. re: Mike’s comment below: I can only agree. That slide just cracked me up. I can’t wait to see what Brenda continues to do. There were a lot of highlights, but Brenda was right up there. And just as you had suggested, she was a welcome cut through the usual presentation types, completely broke the crowd up. Attitude was right on the money. And I think perhaps my favorite two slides of the whole presentation was the giant nose and the huge thermometers. Those were hilarious, I gotta find out more about you guys are up to. Watching your intern rock the SFI PK. The crowd loves her! Why all of the effusive and generous messages? 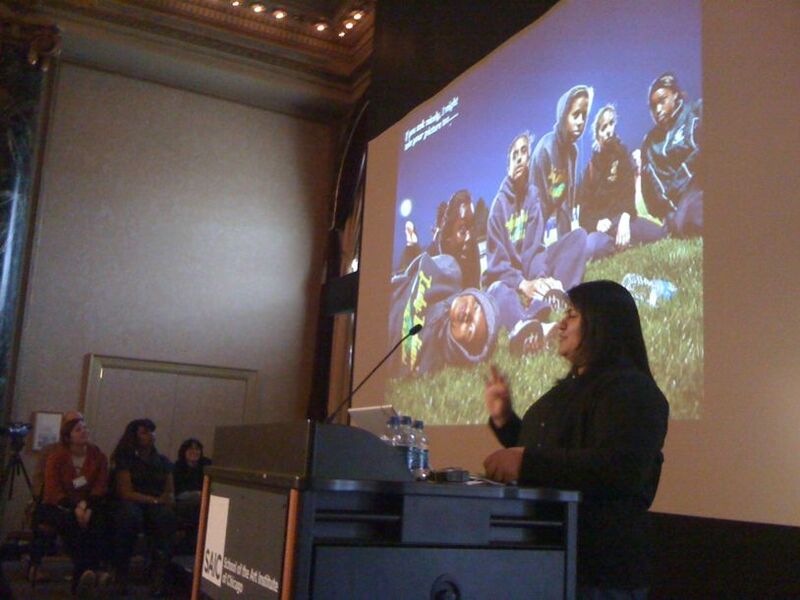 Well, at 1.57 pm, one of our superstar interns, 20 year old Brenda Gamboa, presented Shadelab, our young adult-led community sensing and story gathering project, to over 300 people including the country’s top community designers at the Structures For Inclusion Conference in Chicago, IL. By far the youngest person in the room and one of the only ‘community’ members in attendance, as you can divine from the above comments, she gave an incredible performance apparently eliciting raucous laughter, cheers and even enthusiastic whooping from the audience. Needless to say, I could not be any happier for Brenda who deserves every single ounce of praise for her incredible leadership, her remarkable skills and her essential role in making this project possible. I am also ecstatic for the entire Shadelab project team as we are incredibly proud of this project, the team we assembled and grateful for the incredible support of organizations such as Sensaris, Pivotal Chicago and the Metro Chicago Information Center. One of the shocking realities of this project is that while Brenda is simply outstanding, Nelida, Jeisson, Patrick or any other member of the Shadelab team could have stood in front of the Structures For Inclusion audience two weeks ago and wowed everyone. I say this not to diminish Brenda’s contribution or to give false ego boosting praise to the other team members. Without fail it’s almost always possible to find ONE good student, designer or leader in a group but to have an entire team is pretty special. However, I think it’s also important to recognize the role of the project—giving young adults a clear role in changing the places where they live, learn and play—in bringing out the very best in every single team member. Congratulations Jeisson, Karla, Sage, Patrick, Nelida and Michael! Although Brenda’s storytelling is obviously missing, have a look at the beautiful presentation she and I worked together to assemble. And by the way, all but one of the photos were taken by Brenda. Yep, she’s good, really good. And if you live in the Chicago area, she has her own photography business- hire her. I was super happy that 28 Chicago teens from After School Matters got to see her presentation along with all the other SFI attendees. Very inspiring!